Chants of Survival is an evening of original compositions by Music Composition masters candidate Leslie Allison alongside interpretations of chants from 1158, 1984, and 1999. Performed by Jane Alden, Leslie Allison, Judith Berkson, Nicholas Burnham, Laura Cetilia, Ian Davis, Alex Donald, Naomi Glascock, Katrice Kemble, May Klug, Roby Mann, Paula Matthusen, Barbara Merjan, Aili Niimura, Cleo Roberts, Lisa Stein, Andy Tan, Yu Kai Tan, and Ed Wang. Posted by michelle on October 30, 2018 at 1:49 PM. It’s fall and you know what that means: Pumpkin Fest! Grab your friends and family and join us at Long Lane Farm’s annual Pumpkin Fest, Saturday, October 13, 2018, from noon to 4 pm! Featuring live student bands, farm tours, crafts, baked goods for sale, a pie-eating contest, vendors & student groups, FREE veggie burgers and cider, and much more! Visit wesleyan.edu/coe for more info. Sponsored by Long Lane Farm, the College of the Environment and Bon Appetit. Rain date: Sunday, October 14, noon to 4 p.m.
Posted by michelle on October 9, 2018 at 9:45 AM. 1968. USA. Dir: D.A. Pennebaker. Documentary. 79 min. The godfather of cinéma-vérité gives you front row seats to moments that have become rock ‘n roll legend: Pete Townshend busting his guitar, Jimi Hendrix burning his, and Mama Cass watching Janis Joplin in awe. The wildly diverse lineup includes Simon & Garfunkel, Otis Redding, and Ravi Shankar, who mentored The Beatles. Posted by Film Board on September 27, 2018 at 4:00 PM. Superb jazz chanteuse Somi blends modern jazz, African music, and the singer-songwriter tradition, combining the musical and cultural worlds that resonate with her as an African and American woman. An Illinois-born resident of Harlem, she is the daughter of immigrants from Uganda and Rwanda. Highly regarded as both a scholar and artist, Somi is a TED Senior Fellow and the founder of New Africa Live, a nonprofit that champions African artists. Posted by michelle on October 10, 2017 at 1:07 PM. WESU’s (Wesleyan’s college radio station) will be hosting our annual fall record sale on October 8th in Beckham Hall. There will be record vendors from all over the Northeast selling everything from vinyls to concert memorabilia. Live DJs will be spinning vinyl all day! Posted by michelle on October 4, 2017 at 1:04 PM. The 41st annual Navaratri Festival of Indian music and dance at Wesleyan University opens with this talk hosted by the Music Department. Posted by michelle on September 26, 2017 at 9:48 AM. As you probably know by now, there is a fun event coming up this weekend called The MASH. 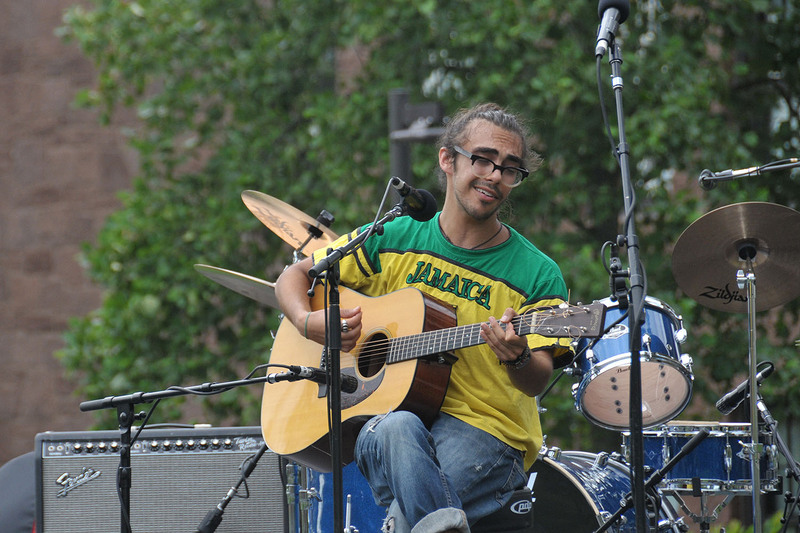 The MASH is a performance event that happens every year during the first week of classes. It provides spaces and resources for different bands, singers, and artists to share their talent. Shoutout to Harrison Nir ’19, the student intern who has done a ton of work to make this event happen this year, and also Hanna Orovec, the staff member in the CFA that oversees the event. Give Josh‘s post a read if you want to know more about how this all came together. All of the groups that perform are Wesleyan affiliated, whether it be alumni bands like the one Michael Roth ’78 is in, faculty artists, or new ensembles like Good Morning Connecticut (GMCT). Below are some short interviews of student bands, including the aforementioned group GMCT, and another called Bonanza. We’ve also got some words from bassist Johnnie Gilmore ’18. Posted by Sam on September 9, 2017 at 1:26 PM. The Wesleyan Concert Choir, under direction of Adjunct Assistant Professor of Music Nadya Potemkina, presents a program featuring both a cappella and accompanied selections from classical and modern choral repertoire. Posted by michelle on May 6, 2017 at 12:00 PM. The Chinese Music Ensemble presents traditional and contemporary repertoire under the direction of Huan Li. Students from the Wesleyan chamber music program perform works by various composers on a variety of instruments. Posted by michelle on May 5, 2017 at 10:00 AM.